Like seeing creatures, both grotesque and beautiful. When Russell explained that there would be no dialogue, I wasn’t as worried about agreeing to be a part of the film. I’ve long thought that my handsome features speak for themselves, so I figured I’d be a perfect fit. Of course, I was just lazy, and not having to remember dialogue was a big plus. Another plus was that there were a few scenes to be shot, and the entire film would be under ten minutes long. Being a long time fan of the horror genre, it’s also a bit of a kick to be a part of one of those films. As this past weekend approached, I was a bit nervous about my energy levels being so low. Gwenn came a long to make sure I didn’t push it, and I’m glad she joined me for the adventure. When the temperature dropped below what we all expected, Gwenn made me buy an XL “Coney Island” sweatshirt. In between takes, she’d wrap me up in it; that was nice. The small group that Russ had assembled to help shoot the film, transport equipment, and just be on hand in case anything went awry was wonderful. Aside from the occasional light rain, we lucked out in the Unforeseen Circumstances department. I’m not an actor. Anytime I’ve ever been filmed, it’s just been me being me. 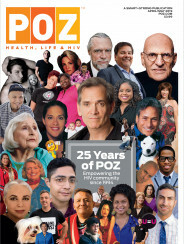 A positoid who is comfortable in his own skin, trying to alleviate fears, and hoping that the viewer is set at ease either about their own HIV status, or their own reluctance to get tested or even allow the reality that HIV is out there. For this, I had to be the exact opposite- a scared young man... with no words at my disposal to convey those emotions. Instead, I had to use my eyes, or the twitch of a finger, anything that came to mind. It was a fun challenge. Not sure when the film will be done, but of course I’ll keep everyone updated on this blog. Till then, do your best to keep your own lives from becoming the stuff of scary movies. It is possible- be your own hero.